Not sure if there's any transformer fans here but there is an alternate universe comic series of it like DCs Elseworlds , called Evolution with Hearts of Steel being steampunk orientated. Just my creations will now be on the Steam Emporium. I am a little behind in posting the things I have made in the last few months. Hope to correct that soon. Any comments or input is welcomed. Yes! HOS is probably my favorite comic series now! Preorder Mastermind's Cyclops, hunting down a Knight Morpher Annihilator. I am a Steampunk Jeweler and did a rather extensive MA Thesis on the Steampunk genre. My website shares more of my ideas on Steampunk as well as a link to my thesis. Thanks, I'll have to add a few of these sites to my link page. Shameless self promotion! etsy.com/shop/corsetsandcogs I just finally got on Etsy, so im trying to spread the word. We create Steampunk jewelery clothing and more! That's linking to a particular page that has the most steampunk look and feel to it (the site does other stuff so it isn't all steampunk). I know about one site http://www.steampunkdressing.com/ . It's all about steampunk costumes and fashion. 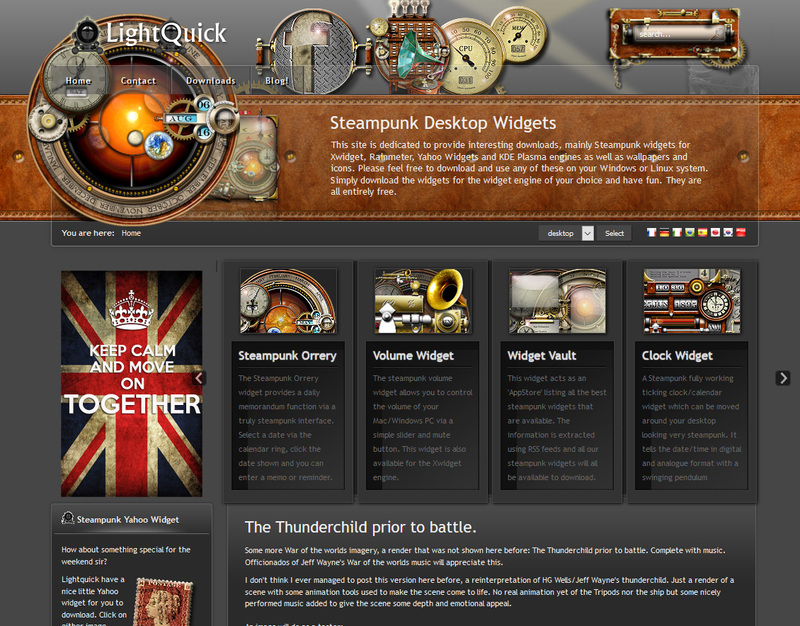 we can also see huge information about steampunk culture and era in blog section. As a youth I voraciously consumed pulp Science fiction books, but being Dyslexic, I tend to learn & absorb information less by reading than I do by sight of a visual image. Therefore pictures are most important to me. It is images which have drawn me personally to SP and why I run several pinterest boards of images. Being partially disabled & living as I do in virtual isolation (as so many SP adherents appear to do) I'm personally far less interested in the fashion of cloths (where would I get to wear such wonderful of outfits?). Therefore it is more about SP in my own home habitation...and since I collect things (restricted by budget ) I have a fascination of the (primarily) Victorian gentleman's 'Cabinets of Curiosities'. As one on the very fringe of the fringes of SP, I just thought I'd add my one penny worth. NB: After I written & posted the above, I found a BG sticky by Mr S Sprocket Re :-"Where is my post promoting my blog". In the spirit of quid pro quo, I duly posted this blog article. Updated the list! Sorry it took me a while. I'm not very active here anymore. Combed through all of your suggestions. I didn't add every single link that was suggested. Some don't even work anymore, others hadn't been updated in a long time. Which was also true for some of the links in the opening post, so I removed those. As for sites that are up-to-date and weren't added -- my thinking was: "Would this link be helpful to someone who is new to steampunk and wants to learn more?" As mentioned in the opening post, the aim here isn't to create an exhaustive link of all steampunk websites, rather a helpful guide. I also didn't include self-promotions for shops or personal blogs that are maybe steampunk-styled but aren't really about steampunk -- another condition I set out. I hope you understand. It's a bit arbitrary, perhaps, but when we're devising a list for new steampunks of sites they can go to and learn more about the genre and movement, someone's Etsy shop for steampunk jewelry probably isn't the first thing they're looking for. I'm not sure if this should go here, or in the Meta-clubs forum, but I thought some people might be interested and find this post helpful. I'm one of the founders of http://www.CitizensofAntiford.com. The website started as a personal project between friends, but it became way too large for just three people to enjoy! At the core, Citizens of Antiford is a collaborative fiction project focusing on world creation. Sort of like a large roleplay site, we have created an entire fictional world for people to base their stories in. We have a large encyclopedia to aid writing and an atlas to help place your characters and their travels. Our members are encouraged to write with one another, making a large interconnected community. Members are also encouraged to come up with new things that can round out the world, and be added to the encyclopedia for other members to use. We even hold contests! Occasionally the "founders" also host a youtube show Antiford on Air, which covers topics like character creation, steampunk media, and promotion of local (currently only New England) steampunk events. We hope a few of you decide to join the adventure! Are these still being updated? Would it be worth adding steampunkjournal.org to this conversation? You see what I did there? I got my website on the page as a conversation and not simply a shameless plug (Please disregard this epilogue). Should we begin to cull those that have fallen by the wayside? Steampunk Home, for instance, hasn't posted in two years. While there is some great reference work in there, there isn't anything current. On the other hand, if anybody knows the blogger and could jiggle an elbow, it would be nice to see more. Whoops! I had posted this as a new thread elsewhere. Blog that covers steampunk, especially steampunk events in Texas. Covers crafting, film, and most often--writing. Various authors. I like it. Keep your chins up and your fedora on! Typical newbee question - I want o include an avatar/banner on The Fedora Chronicles to link back here. Where can I find it? I've interviewed a variety of interesting steampunk cosplayers, feature steampunk art, and sometimes talk about the development of my upcoming steampunk western novel. I will be interviewing several prominent steampunk makers soon, too. We make functional steampunk art. This list is AWESOME! I appreciate your doing the work on this. Cheers! A place to post and discuss all things steampunk!